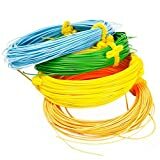 If you are into fishing business, fly fishing lines is easily the most popular type of accessory for you. Every fisherman loves the way their fly does a flush style into the mouth of an enormous fish. But floating fly lines are way more than just casting dry flies to rising trout. Now, the big question is, which is the best type of fly line for optimal performance? Therefore, we have ten best fly fishing lines in our list today. Although the performance of the fly fishing line depends on the type of species you are looking out for and what kind of water you go out for fishing. We have an array of choices that you could explore along with its strengths and weaknesses listed below every product. 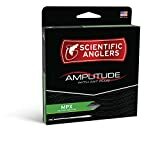 To begin with, the Scientific Angler Amplitude MPX Taper Fly Line is the latest product, which features AST and slickness additive for increased durability and extreme shooting ability. The Amplitude MPX Taper Fly Line come with triple color and triple textured lines with loops on both its ends. One thing that you will notice is the black section of cider at the end of the line. It’s mainly built for a 100-pound core for which it’s easier to catch crazy big fishes like large Tarpons and so on. The black marker at the end of the line is comparatively an advantage. So, when you see a fish running, you will know where’s the end of your line and roughly how far the fish is when you try to bring it back. It’s available in three different line weights so you won’t have trouble finding what you need. We are mainly a fan of its ability to shoot line. The textured finish does help in shooting a farther distance. It shoots like a dream and floats just as well advertised it is. Hands down the best fly fishing line out there. RIO’s Bonefish Fishing Line is a great one for beginners on their first fat trips as an all-rounder line. It’s dependable and versatile with being a fantastic fine for shooting at farther distances. When designing this line, the manufacturers had one purpose in their mind: to load rods quickly. If you believe that bonefishes come at 60 feet or greater distance, well that’s incorrect. They are more commonly caught inside 30 feet or even 20 feet, with the help of roll casts. This design comes with a head length of 35-inches, which distributes more weight towards the front line. The credit for this goes to the unique taper that RIO put on this line, which gives out weight back towards its head and shows delicate presentations. The RIO Bonefish Fishing Line pairs well with almost any rod, which makes it an excellent line for fishers with any skill level. It’s considered to be a staple classic by many of its owners and is highly recommended! 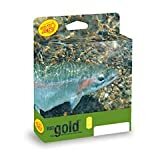 Cheaper than the RIO Bonefish Fishing Line, the RIO Gold Fly Line is a beautiful all-rounder line on the different level. RIO is known for its incredible stability and distance, and the Gold Fly Line is no exception. It’s perfect for any medium-sized fast action rods. As you must have known that pulling the line from underwater requires more strength and power than topwater fishing. Hence, the RIO Gold Fly Line provides incredible potential for an optimal fly. There’s nothing that the RIO Gold Fly Line isn’t capable of. It rolls casts well, floats excellent, shoots nice and makes a great choice when the situation calls for much of nymphing to streaming. Other fly-fishing lines might be great at specific tasks, but this one is an amazing multitasker. And when it comes to durability, this one has got to be the best one. Available in an array of colors and sizes. The brighter colors make the line more visible on the water. It’s easier to see the line when casting and fishing. And of course, vibrant colors always make it more Insta-worthy photos. This floating line will completely change your fishing game. 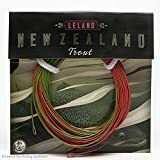 While most fly-fishing lines allow easy casting, this Leland New Zealand Trout Fly Fishing Line is a balanced gear designed that you will ever touch. It provides for the components of a rod, line, and reel to complement each other. It has the Leland custom fly line that provides an efficient and universal profile of the line, which enables the angler to set out just about in any conditions and still give an accurate delivery on its target. With the welded loops on either end, it’s an easy rigging. This fly-fishing line is beyond aesthetically pleasing. The reel has a perfect balance, and when it’s joined together with the fly rod, it arguably makes a beautiful kit you will ever lay your eyes on. Although it’s not the cheapest of all products in the market, you sure can’t go wrong with this line. Last but not least, this fly-fishing line comes with a three pack of the world-famous Leland New Zealand tapered leaders that will be more likely to provide near-mend fewer drifts and ultra-efficient casts. The braided multifilament core gives proper handling and a killer performance in a wide range of conditions. In tune with that, the integrated slickness reduces friction. Just as we said it’s compact, it’s half-sized heavy that makes it heavy enough to load the rod. And of course, the head transfers more energy to the leader, making for better turnover. It is, in fact, very slick. What makes this fly fishing line particularly a favorite for its consumers is its highly durable welded loop and the line ID. Each track has the weight, functionality, and taper printed on it. Therefore, it’s an excellent option for those who are considering fishing as a hobby that comes at an attractive price. The Bozeman FlyWorks Floating Fly Line is no joke. 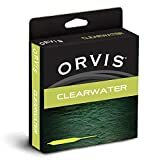 While most of the other fly lines come in a box, this one comes with a complimentary case, which makes it easier to carry it around to your fishing spot effortlessly. The fly line has been tested and verified to be an excellent one on different water conditions. In fact, some consumers have marked this fly line to be an essential tool when going to fly fishing. The reasonably priced fly line has excellent control and is quite light for its weight. Plus, as some of you may complain that the lines float on water, the Bozeman FlyWorks Floating Fly Line is entirely different. Instead, it’s very slick and casts well, too. What’s more, is that each end of the line is welded for easy changing of leaders. The quality fly line is extremely durable. The manufacturers strive to provide with affordable yet quality goods so that more and more fishing enthusiasts could take it up as a hobby. 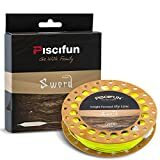 Fishing does require a lot of patience and care, and this Piscifun Sword Fly Fishing Line undoubtedly provides the fishing experience you can ever have. This fly fishing line is enjoyable to use considering its tolerance. 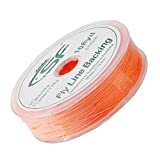 Available in five different colors, this high-end fly fishing line is the most versatile line that you will come across, especially for trout fishing. Whether you are a beginner or an expert, this one’s for you. The sleek and enhanced welded loop makes it quicker and easier to hold it up for repeated use. The truth is, the welded loop transfers more energy efficiently to the leader, allowing enhanced turnover. On top of that, the braided core suits any weather conditions. The bigger diameter with its longer head makes it a dream while casting. Of course, the integrated slickness additive is integrated throughout the PVC layer that provides lubrication for maximum performance, durability, and distance. The innovative weight-forward taper that’s combined with the slightly larger line is able to deliver at a greater distance. So, there’s no need to overpay for high-quality fly-fishing lines anymore. If you get one of these Piscifun Sword Fly Fishing Line, it will suffice. It’s a backing. A backing is used to pull a fish when a lot of lines is pulled off the reel. Hence, this SF Braided Fly-Fishing Line has a terrific performance. With proper hollow braid polyester, it’s available in white, high visibility yellow or orange. This 8-strand hollow braided backing line is made from rot-proof Dacron, which is available in 20 pounds and 30 pounds breaking strains. Suitable for freshwater fishing, this backing line has an excellent resistance for trouts. This backing line has a relatively simple job, and that is to sit there on the reels so that as soon as you catch a fish or star casting at a longer distance, you do not need to worry about it running out. This braid backing line is relative of superior quality. Although it’s made from Dacron, it’s still slim, UV resistant and rot proof, just so you can put a lot of it on your reel without overfilling it. So, there’s no need to worry about the line finishing or over congesting. The SF Braided Fly-Fishing Backing Line Trout is highly recommended because it’s so much better than other brands that have twisted lines. It’s a perfect complement to all fly lines. Aventik Fly-Fishing Line has taken the industry by storm. With the price and facilities that it comes with, more and more fishers are considering to get this line. This dual tone dynamic weight forward floating line is determined to give you mastery. Built with an ultra-low stretch core, this line provides maximum sensitivity and will connect with every fish that you want. Plus, it’s suitable for all weather conditions. It’s all a computer-controlled design and manufactured product. Therefore, it has the best application of physics in the fly line to achieve accuracy at its best. The dynamic structure varies differently on the line weight. The self-lubricated high-tech coating provides with float-ability, extreme slickness and durability even under water. The colors are great and give extreme visibility. 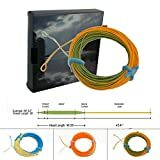 You will be pleasantly surprised at the quality of this fly line at the price that it comes with. Last but not least, we have the Sougayilang Fly Line 100FT Floating Weight Forward for Fly Fishing. This is undoubtedly the best designed and also the most versatile line for all-around trout fishing. Perhaps, without this, your fishing experience would feel incomplete. This fly-fishing line very much dependable and durable at the same time because of the exclusive high-tech coating that it has. This innovative weight-forward taper makes it an ideal fly-fishing line for medium ranges. But it’s also able to deliver at farther distances. And not to forget about the braided core line that gives optimal performance. The four colors that it comes with immensely helps in determining the location for casting. So, you need not to worry about getting lost in the lake. It comes with a 60-day money back guarantee and is an excellent fishing line that is exactly what you are looking for. There are two ways you can look at this feature: the size of the material and its make. A thin, light line will throw a shorter distance, unlike a thicker and more massive line. That’s because the lighter line has a lesser drag in the air and guides. And of course, the material has a significant effect on the casting distance. Just so you know, a 30-pound braid casts an extended range than 20-pound fluorocarbon. Nymphing: Fly-fishing lines, no more than 4 – 6 grains of weight are perfect for nymph fishing. Roll Casting: This is what most fishers prefer as it only needs one forward stroke. Usually, a double taper fly line should be ideal for this type of cast. Shooting: It’s the length of this line that can go through the tip once the line has been released from your hand. It’s not similar to the distance as this fly line shoot farther away doesn’t cast as far. Now, you may not go fishing, but it’s important that you line last you long enough. Most of the tracks came with a PVC coating and made flexible, soft and durable by adding extra plasticizers. Other brands use polyurethane as the base material that forms the line more durable and resistant to cracking. Evidently, there are a lot of features that make up to the best fly-fishing line. What you need will make it ideal for you. Consider whether you will go fishing in the rivers, saltwater, lake or freshwater bodies. Once you shortlist all these kinds of factors, it would become more comfortable for you to choose your fly line. Let us know which fly-fishing line you liked the most and which is the one you are finally going to buy. We’d love to know! Happy fishing!